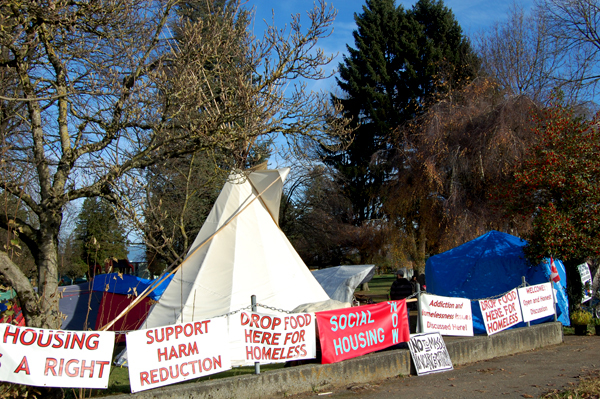 ABBOTSFORD – Residents of the homeless camp in Abbotsford are fighting back the city’s move-out notice with a human rights complaint. On Monday, city authorities posted a notice for the residents to remove all their tents and belongings from Jubilee Park, citing safety concerns associated with extreme weather conditions as the main reason. The camp in Jubilee was set up after another site along Gladys Road was smeared with chicken manure to drive out the homeless in early June. “After reviewing numerous documented occurrences of fire safety violations including the use of propane barbeques within the tents as heat sources, criminal activity, drug use, and the additional concerns raised by the recent arrival of sub-zero temperatures, Council felt it was imperative we act now before someone gets hurt,” Mayor Bruce Banman said in the news release. However, according to lawyer DJ Larkin, the issue is that the camp’s occupants have nowhere else to go if the camp is dismantled. Larkin and Pivot Legal Society offered their services to several residents of the camp. Together, they are filing a human rights complaint against the City of Abbotsford and the Abbotsford Police Department. “These people have come forward and they have asked for help, they’ve asked us to find a way to help them through the court system, to demand that the court system respect them,” Larkin addressed the media at the homeless camp this afternoon. The complaint is based on several cases of alleged harassment and damaged property – including the summer chicken manure incident, among others. One camp resident says the local police officers have slashed his tent, and set fire to it, in two separate incidents. Larkin says everyone has a right to access public space and non-discriminatory treatment, regardless of their housing situation. The Abbotsford homeless have other supporters as well. BC/Yukon Drug War Survivors, led by organizer Barry Shantz, have been protesting the city’s treatment of the homeless group. Shantz says the issue is not limited to the city’s move-out notices, but also lack of discussion around homelessness in general. Deputy City Manager Jake Rudolph addressed the group’s protests in the news release, saying they have no intention to disrupt the BC/Yukon Drug War Survivors’ right to protest. Larkin says the reason Abbotsford faces homelessness issues of this magnitude is the lack of shelters and similar facilities in the city, compared to other municipalities in the Lower Mainland. According to the news release, the city lawyers will be seeking legal action if the tents are not removed within 48 hours of the notice, which is by Wednesday evening. This article was originally published on the BCIT News website on November 27, 2013.